It’s autumn and we’re quickly heading into “the ‘R’ months,” that time of year when oysters are considered to be at their best. While oysters themselves are not known for their good looks, the plates they were once served upon are. And southerners from Alexandria to Savannah and all the way down to N’awlins just love displaying them in their china hutches and on their walls. 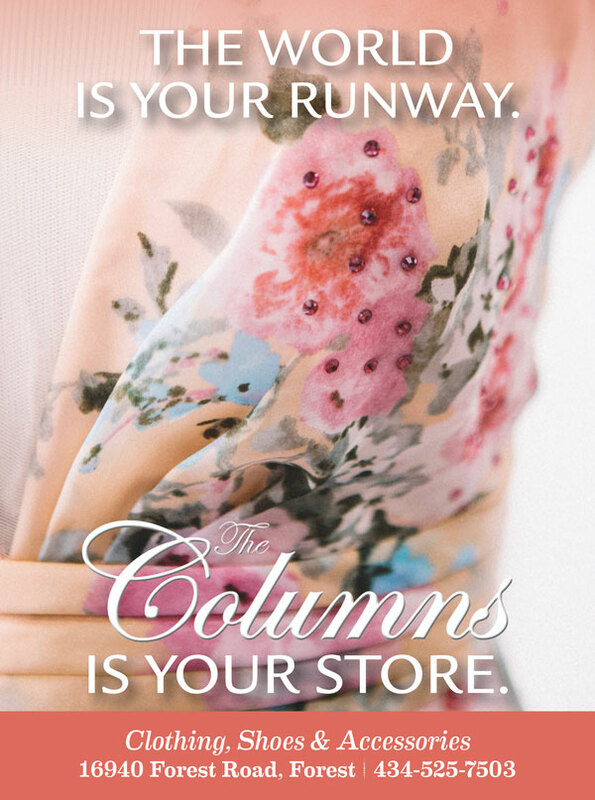 They’re a throwback to genteel times—and they happen to look terrific mixed in with stylish, modern décor. Much like the shellfish they once served, antique oyster plates are a delicacy. 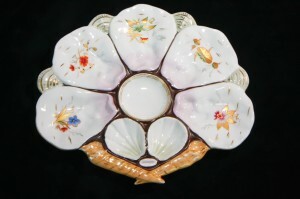 The heyday of the oyster plate was during the Victorian era, between 1810 and 1870. When well-traveled American hostesses noted that oysters were a mainstay on menus abroad, they began serving them back home by the plateful. In fact, the oyster craze was so prolific that by World War I, oysters were so over-harvested that they threatened to become extinct. As the oyster trend began to wane, so too did the need for an oyster plate. Most antique oyster plates, usually made of porcelain or pottery, feature several recessed wells and are beautifully hand-painted with ocean-themed designs of sea creatures, often of the bi-valves themselves. A marked improvement on the saltines-and-shot glasses some folks serve from today! 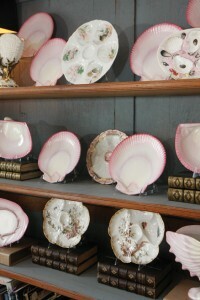 Antique oyster plates can be found in a range of $75 to $500 per plate, sometimes more. Most favored by collectors is “majolica” pottery. Majolica is a type of glazed earthenware pottery, not a brand. It is usually brightly colored and features hand-painted, realistic scenes from nature. Majolica pottery’s origins come from Majorca, an island near Spain, but its style has been copied and reproduced in countries all over the world for hundreds of years. Common manufacturers of Victorian majolica include Minton, Wedgwood, Haviland, Limoges, Quimper and George Jones and Sons. For collectors, the most highly sought oyster plates come from France. There are three basic shapes for oyster plates: geometric, kidney-shaped, and a special five-mold configuration nicknamed “the turkey.” Geometric plates feature a perfect circle of six oyster molds arranged in a ring with a space in the center for condiments. Kidney-shaped oyster plates refer to the shape of the plate itself, which is somewhat crescent-shaped. When the mollusk-holding depressions on an oyster plate are arranged in the piled-upon look of an oyster bed, this is called “the turkey” because, when viewed another way, the configuration resembles a turkey. The depths of the indentations in oyster plates vary, indicating a specific style of service. Collectors can find very deep-welled plates that were designed for serving oysters over ice, plates with moderate indentations for serving oysters still in their half-shells, and plates with round depressions designed to serve shelled oysters and their liquid. As with other kinds of collectibles, reproductions of antique oyster plates abound. Often, reproductions will have small holes on the backside so the oyster plate can be displayed on a wall. If an oyster plate is truly Victorian, it will be very lightweight and delicate, and therefore should not be hung because plate hangers can scratch and stress the fragile plate. 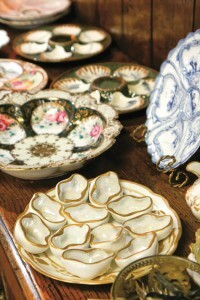 A better display method for an antique oyster plate is on a wooden display stand or in a china hutch. 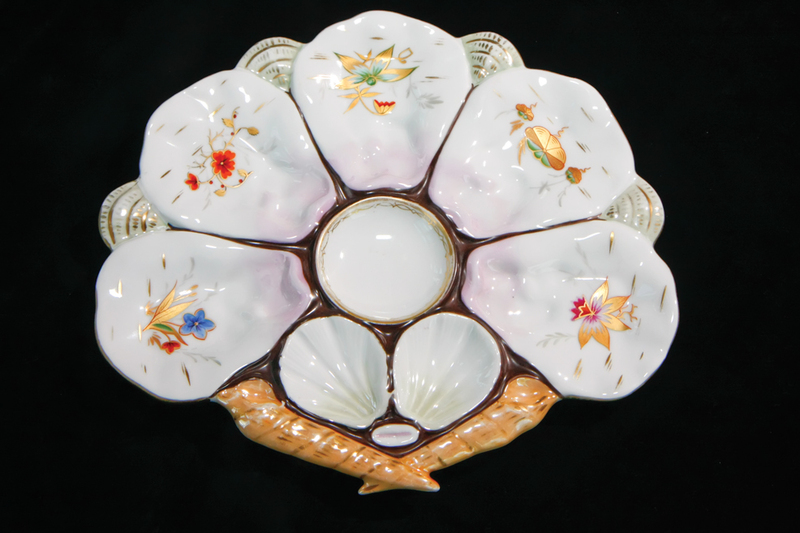 When purchasing an antique oyster plate, you’ll want to avoid buying one with chips or cracks. Some scratches in the glaze etched by the wear and tear of rough shells can be expected, but chips and cracks will decrease the investment and the décor value of an oyster plate. The most valuable oyster plates tend to be the ones with deep wells designed to serve pristine, shucked oysters. By the way, it’s also not advisable to eat on an antique oyster plate, not because of the risk of damage to the plate, but because most antique pottery glazes contained very high levels of lead! 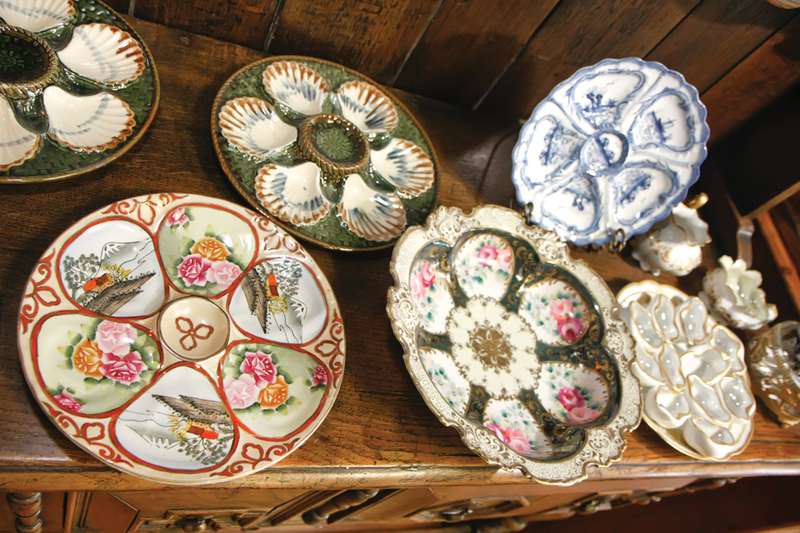 Experienced and beginner collectors alike might want to purchase an oyster plate guidebook and get to know a reputable antiques dealer that specializes in collectible china and pottery. Guidebooks can educate collectors about markings and other details to help them better understand their plate’s origin and history, and indicate a little bit about their value. Of course, reputable antiques dealers can also verify the authenticity of a plate and are usually happy to share their expertise and love for such a unique collectible. Beauty is in the eye of the beholder, and as with other works of art, choose what appeals to you. Whether yours are chosen because of their color, shape, pattern or design, your collection of oyster plates will quite literally be an acquired taste. We wish to thank Martha and John Layton and Cheryl Stone for allowing us to photograph their private collections of oyster plates. The plates from Black Horse Manor Antiques are available for purchase, should you decide to start your own collection.